This article was originally written by Jordan Hansen and appeared in The Daily Iowan on October 2, 2015. It has been republished with the author’s permission. 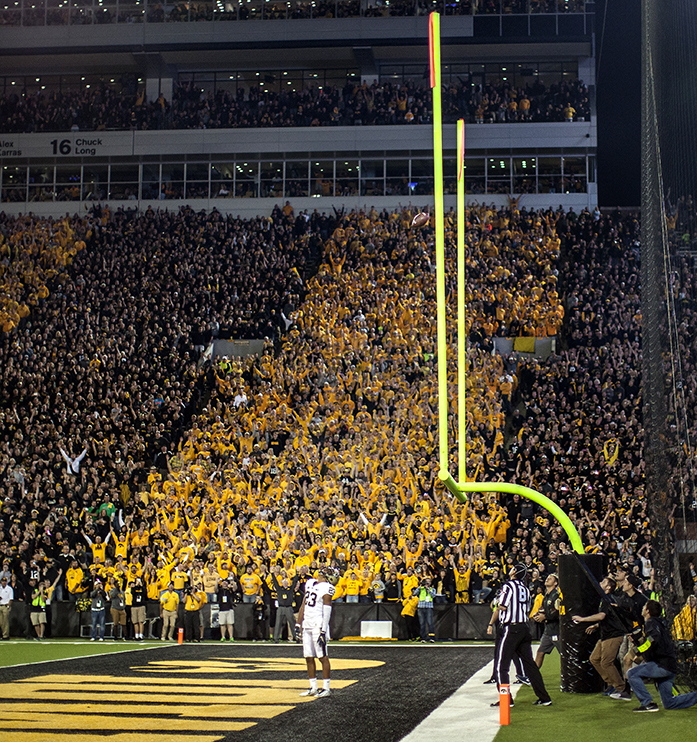 Until a 57-yard field goal sailed through the uprights in Kinnick against Pittsburgh on Sept. 19, Marshall Koehn wasn’t often in the spotlight — both good and bad. Outside of missing three of his first five college field goals and being a touchback machine, Koehn wasn’t mentioned very often. Things are different now. He’s an enigma, a star. And that’s a long, long ways from where he started. Koehn, a native of Solon, was part of a high-school class that won four-consecutive football state championships 2007-10. The first three were in 2A, the final in 3A. He played numerous positions on those teams, with kicking coming secondary to his other duties. Koehn still managed to put up impressive kicking numbers — 17-of-24 on field goals and 161-of-181 on PATs — and he had the attention of several colleges, including Iowa. When he was offered a chance to be a preferred walk-on by the Hawks, he accepted. Fast-forward to the beginning of his junior year. Koehn and true freshman Mick Ellis battled for the job in fall camp. Koehn won the competition but struggled during his first two games. He went 2-of-5 against Northern Iowa and Ball State. Things got so bad, head coach Kirk Ferentz decided to burn Ellis’ redshirt after Koehn missed a 37-yarder against the Cardinals. The change wasn’t successful; Ellis missed a 29-yard field goal and only saw spot extra-point duty for the rest of the year. Koehn has missed exactly one field goal since being pulled during the game with Ball State. Consistency is a favorite buzzword for coaches everywhere, but for Koehn, it holds more meaning. During his senior year at Solon, Koehn worked with Nate Kaeding, the former Hawkeye and one of the most accurate kickers in NFL history. A lifelong Iowa fan, Koehn sucked up every word from his favorite kicker as a child. It wasn’t not the only time the two spoke. As Kaeding says, he became a mentor to Koehn. While wanting to give Koehn plenty of space, because he was back in Iowa City, Kaeding figured he could help when needed. “I learned to appreciate the importance of having someone close by that you can shoot questions to and can be supportive of you when things are going poorly,” Kaeding said. “I kind of serve as a navigational buoy, so to speak. Having Kaeding as a friendly, understanding voice in Koehn’s ear has helped. Also benefiting him is an understanding coaching staff. Special-team coach Chris White said before this season he put some pressure on Koehn last year. It seems to have worked. Koehn’s performance has been positive since early in the 2014 season. In his career, he’s 16-of-20 on field goals and 56-of-57 on PATs. His last field goal, the 57-yarder against Pittsburgh, is the longest field goal in the NCAA this season. In fact, only three kickers have made a field goal from 57-plus yards in the last three years — Koehn, Indiana’s Griffin Oakes, and Maryland’s Brad Craddock. Also impressive are the 18 touchbacks on 24 kickoffs he had last season. 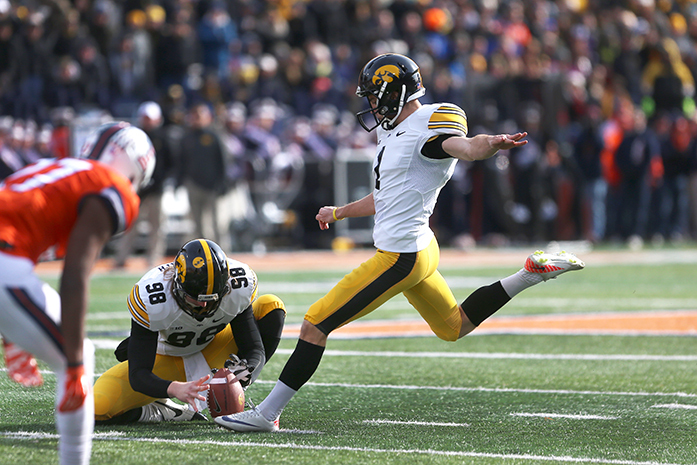 Koehn’s 75 percent touchback rate has him tied for seventh in the NCAA, second in the Big Ten. Touchbacks are a valued stat at the college level and continue to be important in the NFL. It can take a dangerous returner out of the game and avoid the jarring hits that can cause injuries during kickoffs. Interestingly, it’s an improvement over last year, when Koehn had the highest touchback percentage in the Big Ten (63.24) by a whopping 10 percentage points over Illinois’ Taylor Zalewski. That mark was also eighth highest nationally. Even more, Koehn did not allow a single kick to go out-of-bounds. Granted, at least some of his touchback success comes from the NCAA moving the kickoff to the 35-yard line starting in 2013, but rules are rules, and Koehn has taken advantage of them. As good as Koehn is, the rest of the unit deserves at least part of the credit for Koehn’s run of success. Long snapper Tyler Kluver and holder Dillon Kidd have not fumbled a snap this season. Kidd is in his first year as a holder — former punter Connor Kornbrath, who left the program during the off-season, filled the position last season — and Kidd has had no trouble getting snaps from Kluver, who is in his second year as a starter. Kidd said the many hours on the practice field have turned into superb performance, highlighted by the field goal against the Panthers. As the season plays out, Koehn will trust in another process — the professional one. Koehn said every college kicker’s dream is to play in the NFL, and he would consider it. While not highly touted on draft boards — he currently is the 16th-best kicking prospect, according to nfldraftscout.com — it’s not an impossible dream. Koehn has the leg. Since the beginning of the 2011 NFL season, only 15 kickers have made field goals of 57-plus. He also benefits from the NFL kicking off at the 35-yard line, the same as in college. This rule changed in 2011 and makes kickers with booming legs all the more valuable. Getting to the NFL, Kaeding said, is a process, and it must be treated accordingly. Making field goals and sending kickoffs into the crowd will look good to scouts. It will also help Iowa win, which, for Koehn, is all that needs to be done at this stage. “You only get so many opportunities, and you have to make the most of them,” Koehn said. “I’m not even looking for the NFL stuff right now, I’m just focused on the next game.